Whatever your goal, whether it’s a project, career, personal life, health or finances, Jennifer said, it’s easy to get distracted. There are many things that can take you off the path and make you lose your lodestar. From clutter to family and friends, hobbies and the ever-important sleep schedule, house chores, the lure of social media and just events in your life, it’s a surprise anyone gets anything done. With all those things pulling your attention in many directions, often at once, how do you keep to the task of achieving your goals? Jennifer had these suggestions. Set SMART Goals: The acronym SMART stands for specific, measurable, achievable, relevant/realistic/recorded and time-bound. That means having goals with a structure to help you plan and track your progress. Create a Picture of Success: It often helps to visualize your goals. Know what it will look like and the goal moves from an abstraction to a real, attainable thing. Keep Them in Sight: Have a list of the tasks you need to complete; make sure there’s a schedule and have it calendared so it’s clear and deliberate. It can also help to have some visuals such as pictures to keep you focused. 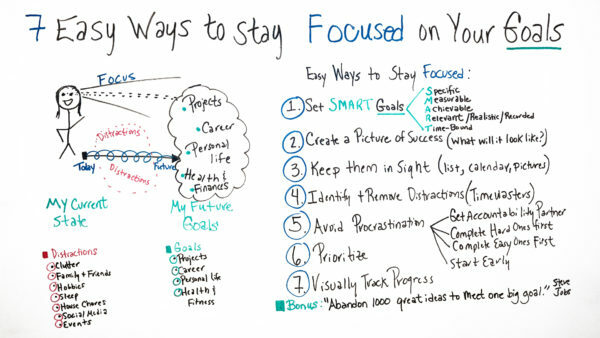 Identify & Remove Distractions: Remember those pesky distractions? Now it’s time to do something about them. Some things that pull us away from work are unavoidable and important, but others are time-wasters. Make the distinction and terminate with extreme prejudice those distractions that can be lost. Avoid Procrastination: Procrastinating comes in many forms, from taking a coffee break to overdoing it with research. It’s important to nip this tendency in the bud. Get an accountability partner to keep you on track. Sometimes it helps to do the hardest tasks first or the easy ones first, whichever will keep you busy. Regardless, don’t wait to do something. Start early and get it done. Prioritize: One way to help gain order from the chaos of the many tasks you must accomplish to reach your goal is to prioritize them. Not all tasks are created equally, some are critical, while others could be left to the last minute as they’re not so important. Therefore, some you need to pay more attention to than others, but you won’t know until you prioritize. Visually Track Progress: To get to your goal you must know where you are. That means having tools to track your progress, using tasks and milestones to break a big project into more digestible parts, and being able to see where you currently are in the big picture. Pro-Tip: Jennifer ended with a bonus tip that she got from a Steve Jobs quote, “Abandon 1,000 great ideas to meet one big goal.” Basically, this means that ideas come, and they go, but if you follow them all, they’ll never have a chance to mature into reality. Stay focused on that one big goal. Jot down the ideas, if you must, but get back to work on achieving that goal! Take it Further: For more tips, read our article on how to eliminate distractions and get more done! Because no matter what’s happening, there always distractions all along the way when you’re trying to get from your current state to your future goals. Well, what could some of the distractions be? Well, it could be clutter around your workspace, it could be family and friends who are wanting to always dominate your time, it could be hobbies, it could be sleep, some people opt for sleep instead of working on their goals, it could be house chores, it could be social media or even events. So I think it’s important to identify these when you’re talking about your goals. Also keep them in sight. Be always looking at your goals, whether it’s maybe a list, a list of things, and how you’re going to achieve the goals. Even put them on a calendar, like milestones. And again, pictures. Also identify and remove the distractions. So the distractions we’re talking about, it’s important to understand what they are for yourself and then eliminate those time wasters. Then avoid procrastination. It’s a lot of time easy if you’re trying to achieve big goals, it can be overwhelming sometimes. So you want to put some techniques in place to get you moving forward. So it could be an accountability partner. I know for myself, I have an accountability partner that have my goals, and if I don’t meet those I have to talk about those and really move through those barriers. Some people like an approach of completing the hardest steps or the hardest goals first. And on the flip side, some people like to complete the easy ones first, it’s really preference. I found very successful people who meet their goals and it just is on preference. Also, some people like to start early, do some of the more challenging things first. So it’s all up to you, but getting a strategy is important. Also prioritize your goals. If you have too many goals, know which ones are the most important, so you’re working on those first. And visually track your progress all along the way. So know what your goals are, what your milestones are, and when you see that you’re making progress, it is encouraging and inspiring to keep going. So if we continue to create new ideas and new goals, we’re never really gonna meet the one that’s the most important. So as you can see, a tool can really help you with your goals and your milestones. So if you need a tool that can help you laser focus on your goals, then sign up for our software now at ProjectManager.com.